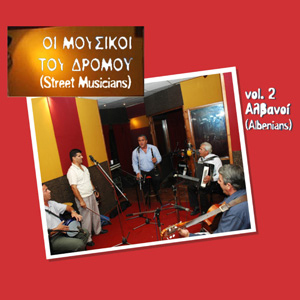 Protasis releases the second album of the collection “Street Musicians”. For the first time in Greece, Albanian “Street Musicians” record a compilation with the most beautiful Albanian songs. Fifteen tracks that travel us to Premeti, Koritsa, Argyrokastro, Tirana, South Albania, but also to Italy (“Marina”) and Smyrna (“Sagapo giati ise orea”)…Songs about love (“Paizeis mazi mou san pedi”), marriage (“Gamos Premetis”), but also historical songs (“Ston platano sto Maskoulore”) and many others.